Note: Need a break from the relatives this weekend? The shop will be closed Thursday and will be open Friday, Saturday and Sunday from 10AM till 4PM. The shop will be closed on Monday and will resume regular hours on Tuesday. Happy Thanksgiving! This entry was posted in news on November 24, 2011 by Theaux Le Gardeur. 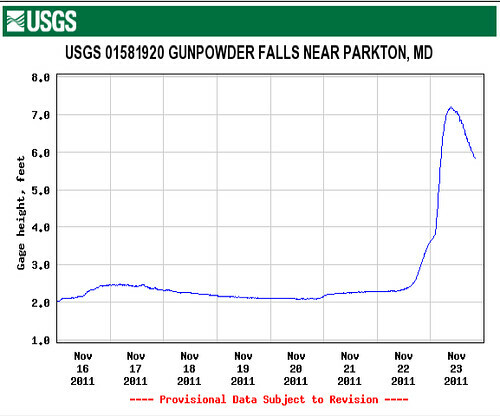 The Gunpowder River is flowing at 124 CFs is 54.5F and clear. Blue Winged Olives are still coming off mid-morning in the flat water. 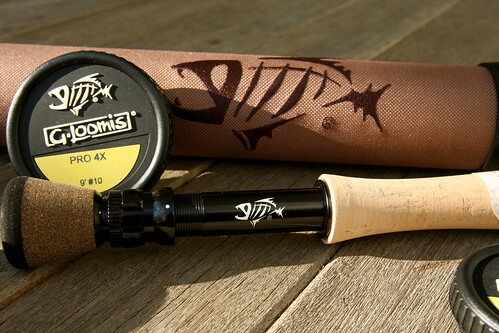 Leaders in the 10ft to 12 ft range ending in 6 or 7x have been necessary to trick the wild fish. With rain in the forecast better fishing days are ahead of us. 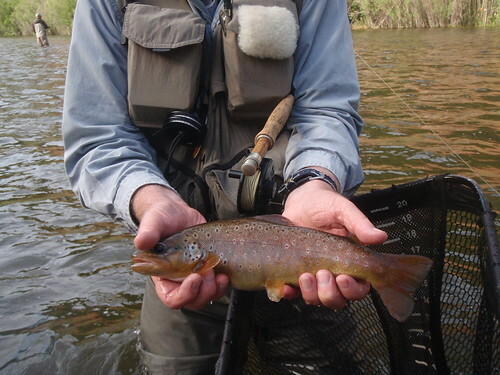 More rain means more spillover-more flow and ultimately, less selective trout. Hard to believe that it is 64 degrees mid-November! Fly fishing after noon with tiny Caddis are still worth a shot. Those intent on swinging flies are finding no shortage of leaves out there. A safer bet is to dead-drift streamers underneath an indicator-especially around the log jams! Judging from my float this past Saturday with Patuxent RIVERKEEPER Fred Tutman there are still quite a few stocked fish in the lower river that are holding in deep pools. 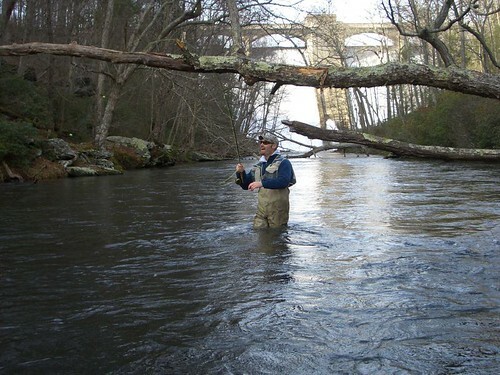 This entry was posted in fishing report on November 15, 2011 by Theaux Le Gardeur. Thanks to Mike for the stream report, gear review and pics. It was great to talk with you today. I look forward to getting the three sets of the Simms HardBite star cleats for the Guide wading shoes…once again, you’ve pointed me in the right direction. They are awesome–both the shoes and the cleats. As to the Airflo Ridge Trout line with the loop, as I mentioned, when fishing on the Fryingpan below Reudi Reservoir (as I’m sure Jason knows, that’s a hog lot if there ever was one), after hooking and playing 5 or 6 22″+ fish, I noticed that the loop on my leader had almost cut through the loop on the line. Not good. So I had the local fly shop (Fryingpan Anglers–great shop, once owned by John Gierach’s friend Roy Palm) cut the loop off and nail knot a piece of heavy mono to the end of the line and tie a perfection loop on to that. Just wanted you to know that the factory loop isn’t as robust as you and I might like it to be. 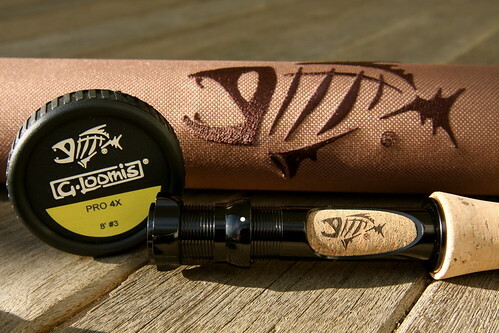 I absolutely love the line, and would buy it again in a heartbeat…just wouldn’t use the loop.Attached are pics of the 22″ bow I mentioned–6X fluorcarbon tippet and a #20 flashback baetis nymph, as well as the uniquely (IMO) colored brown I mentioned. Thanks so much for the hat and the brook trout shirt you’re sending. I really appreciate it. Hope you have a good trip. 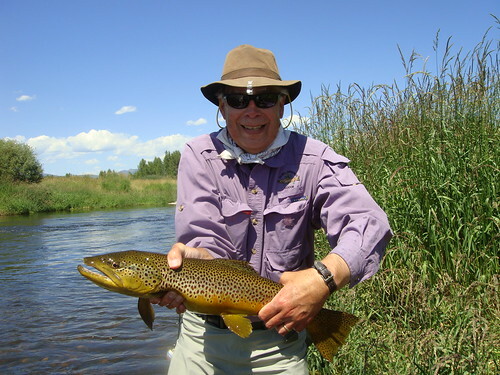 This entry was posted in fishing report, reviews on November 10, 2011 by Theaux Le Gardeur. Thanks to Tony for the stream report and photo…better hold onto that camera before that fish eats it! Great news – those St. Joe Deceivers you tied for my Canadian trip (2) years ago work really well. I caught both fish on my 6 weight with those flies. They have a really nice action and I would like to commission your shop for some more! In the words of my Ojibway Indian guide who saw everything happening in the water, “Holy Jesus, that is a monster”. New personal best on a fly rod that I built myself – 47″ 33 Pounds. 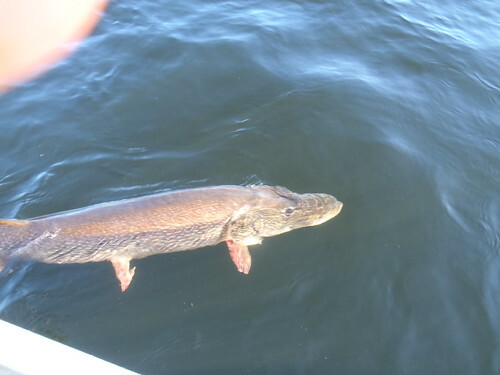 This entry was posted in fishing report on November 8, 2011 by Theaux Le Gardeur. I had a great week of fishing in Colorado Aug 8-12. 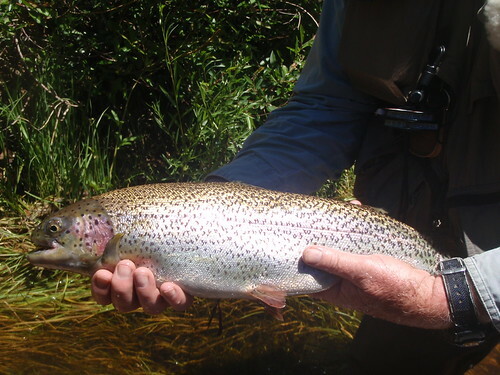 For the last 10-12 years, I always try to catch a rainbow on my birthday in August, and it isn’t always easy to find reliable water out West to have great fishing. Over the last 6 years, I have found that the waters around Steamboat Springs are high, clear and trout-abundant around mid-August. This year, even more so, because of the extremely high snowpack this last winter. I fished for 5 straight days and averaged 20-24 good fish every day, but it wasn’t until the last hour of fishing on the last day, Friday, I caught the 22” rainbow and 26” brown in these pictures. In both cases, it was a “one-cast chance”, as the fish were in clear, relatively shallow water, and a missed-cast would certainly spook them. So, I was lucky enough to 1-cast each of them, fight them hard for quite a few minutes each, and bring to hand a couple of beauties that are a credit to the name “trout”. I’ll be back on the Gunpowder next weekend; but it will be awhile before I forget these 2 beauties! This entry was posted in fishing report on November 2, 2011 by Theaux Le Gardeur. Please join us for a flyfishing school. On Sunday, November 6, a Backwater Angler Guide will be teaching a fly fishing school that is ideal for beginners. If you’re planning on fly fishing in Maryland, or anywhere else for that matter, this course is a great introduction to the sport. The school covers knots, casting, gear, fly selection and an hour of on-stream instruction. 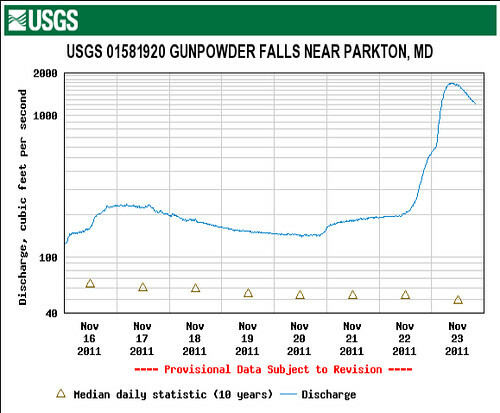 Schools are held in a meadow overlooking the Gunpowder river by a Maryland state licensed and insured fishing guide. Class is held from 11:00 AM till 2:00 PM. Cost is $100 per person and includes the use of gear. A Maryland non-tidal fishing license and trout stamp is required and may be purchased prior to the class with check or cash at the shop. Class size is limited to 4 and pre-payment is required. Please give us a call at 410-357-9557 or drop us a line at info@backwaterangler.com to register. This entry was posted in events on November 2, 2011 by Theaux Le Gardeur.